When you go to a league practice you can count on a few things. In the wintertime it’s going to be cold. In September, it’s going to be hot. Someone will run practice. And Legs Luther will be there. She is that player that you underestimate when you line up on the jammer line and she’s blocking on the opposing team. The one you think “ah, I can get by her.” Just when you think you have a clear avenue through the pack she’s there, steady, determined and in your way. How did you come to derby? I had skated a lot when I was a kid, too. Rainbow Rink was the place to hang out when I was younger so I was there every Friday and Saturday night. Also, I had watched roller derby on TV when I was a kid, but even though I live in North Tonawanda, I didn’t know about QCRG. I didn’t know that there was roller derby now and then a friend of mine saw a poster for training camp during Canal Fest at the Elk’s Lodge. She said: “we should do this.” I said: Ok! We started boot camp that August. Did you have any idea of what you were getting yourself into? I had no idea. In my mind it was going to be a one-year thing. I would skate and then I’d be done. Why did you think you would only do it for one year? I thought I was too old. I didn’t want to get hurt. I thought if I got a year out of it I would be lucky. But at the end of the year we scrimmaged a team from Toronto. I remember feeling really good. At that point I thought: I want to keep skating. I became more determined at that point, too, to stretch myself and push myself to learn more and try more. It was really hard. I had bowled and played softball before but I had never done anything as physically demanding as roller derby. You kind of think you are invulnerable with all the gear on. But when you fall it hurts, no matter how much gear you have on. My biggest goal during boot camp was to not fall. Now that I look back that was kind of a stupid goal. I didn’t try as hard as I could have. At that time I just wanted to survive it. Were you nervous about the draft? Yes. There were 27 eligible draftees and only 20 spots. It was nerve-wracking. We scrimmaged on the Tuesday league practice before the draft. Black Lizard was showing me something and during the scrimmage she asked me if I wanted to jam. Actually, I don’t remember if it was to jam or to block. I told her I wasn’t sure so she said she would go out there and show me what to do. During the jam she fell and dislocated her shoulder. I went into shock. I felt so bad that she went out to show me something and ended up getting hurt. I had a lot of different ideas for names and whenever I thought of one I would go onto the website and check to see if it was there already. And they were all taken. I do bushido kai, which is a form of karate so I thought I’d try to pick a name connected to kicking or legs. Someone had a derby name that was like Superman and that led to me think of Legs Luther. So what do your kids think of you playing roller derby? I have three girls: 15, 10, and 7. My oldest is embarrassed that I play. The middle one likes it a lot. The little one is okay with it. The two youngest came to the championship bout and made a sign for me. The oldest one refuses to come. She’s a teenager, I guess anything I do embarrasses her. What else do you do that embarrasses your kids? My oldest doesn’t like when I sing. I took singing lessons for a while but I had to stop when I was pregnant because I couldn’t do the breathing exercises. I also took piano lessons to help me with the singing lessons. Do you think it’s important to skate derby and show your kids you can do this? I do. It’s important to show them that I can do anything. Then they will know that they can do anything, too. I took a hip hop class recently. So I’ll rock the after party. So, singing, piano, hip hop, karate, roller derby. What else? This is your fourth season, what’s ahead for you? I was thinking of retiring this year. I have rheumatoid arthritis and fibromyalgia, which can make it difficult to skate at times although, they are also the reason why I go to practice all of the time. Skating helps. I was diagnosed with RA six years ago and the fibromyalgia the year I started skating. Skating helps keep my joints active and that helps reduce the symptoms. 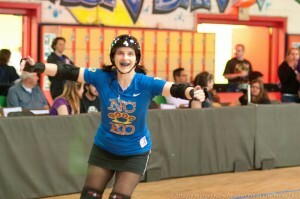 What does your doctor think of you playing roller derby? She laughs at me. Actually the nurse practitioner asks me why I do it, but the doctor is very enthusiastic. The RA and fibromyalgia make it harder to get through a practice some days, especially when my muscles hurt a lot. The person running practice will tell me to get lower and some days, I just can’t. I found if I take my medicine before I skate it helps. Sometimes after practice I go home and take a two hour nap I’m so tired and other times I’m fine. Did you realize roller derby was going to take over your life? I didn’t. Does anyone? But I really like to skate. Derby feels good. It’s great exercise and it helps with the RA and fibromyalgia. I’m out with my friends. When you skate you get to leave everything behind: work, cleaning, laundry. You can just forget what else you have to do when you are skating. I’m lucky that my husband stays home with the kids. That’s a big help. Does your husband enjoy derby, too? He does. He comes to the bouts and likes to hang out with his derby Knockout widower buddies. My heart wants to skate roller derby forever but sometimes my body wants me to slow down. This year I want to get better at hitting – both taking them and giving them. I want to push myself to try things that I wouldn’t normally feel comfortable doing. I’ve been learning things that I had been afraid to do before like turns, jumps, skating backwards. I also want to learn all of the new rules and strategies. Have any favorite foods you like to eat? What’s one favorite derby moment that you can think of? My favorite moment has to be when we won the Queen City Cup Championship in 2012. We had worked so hard together as a team and it felt so amazing to win that game. As you can see, Legs Luther is rather short-spoken. Sometimes, during the interview, trying to get her to talk about herself was like pulling teeth. So, in an effort to get a better picture of Legs, I went to her teammates and asked a few of them. Liquid Courage: Legs is the quiet one on our team, but she is dedicated. She hardly ever misses a practice, even league practice. She’s our responsible one, the ‘mom’ who always has anything you could ever need in her purse. However, for being one of the oldest KOs, she is incredibly active, even taking karate until last year. She always opens her house to us for our parties. She’s forever reliable. Fisty: Legs is not always all business. She gave me a very special gift this year, one that shows off her great sense of humor. During an away bout against the Jersey Shore B team one of the refs called me off on a penalty. He said: “blue #99 4th minor!” I looked at him as I continued to skate and said “thank you!” It didn’t dawn on me that I was supposed to go to the penalty box and serve my minute. He said it a couple of times and I finally realized that I had to go to the box. Every year our coach #007 Super Nova hosts a party and all of the girls are randomly assigned another girl to present an award or something that reminds them of the other skater. I get my gift and it’s from Legs. She had a t-shirt made in bright bubble letters that said: I just got my 4th minor, thank you!! It was absolutely hysterical and showed another side to a great person and a great skater. Love you Legs! SuperNova: Legs is honestly the most dedicated, solid player I know. She is consistent with every practice, and because of her passion to learn she has given new meaning to playing “positional roller derby.” Contact sports do not come easy for her, so her talent is earned every practice. She shouts, using a whisper voice. Her humble nature is a solid foundation others can lean on. She is a silent threat on the track; underestimated due to her stealthy positional plays. She is easily the most reliable player that flies under the radar on the track. Give her a position she holds it. When she leaves it, she makes the block and returns right back to whatever position she was playing. She is not afraid to ask questions and or for clarification. Her hand is always up during practice. Ivana: Leg is always there and is always prepared for herself and everyone else (the mom of the team). She is one of the best inside line blockers. I know that she will hold that line or that position without fail. She’s got a great sense of humor and would do anything for anyone. 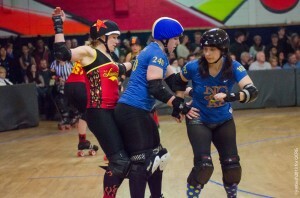 She also volunteers her time to QCRG wherever she can. She loves her kids and stays involved with them. And, she is very humble and short spoken (which is why I am happy to blow her horn for her). The Bombs: Legs is an avid player of “punch buggy” on road trips. Be wary of the “Cadillac Slap” too!